Eastern side of the lower stratum is depicted with Madhu and Kaitabha near the feet of Vishnu standing over the undulating surface shown under Aadhisesha which extends upto the end of the eastern wall. The two ogres Madhu and Kaitabha are rapidly moving to escape from the fire that spit by Aadhisesha. Both are wearing short attire fastened by hip belt around their waist and above it the idaikattu is slackly worn with heavy knots drooping on their sides. Both their head are arranged as jatamakuta and few of the braids left untied. 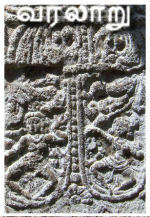 The loose braids are formed as loops and tied as a bunch for the demon near the feet of Vishnu. But for the next demon the hair loops hang upto his waist and the tips are finished with lotus flower. Bangles, armlets, udarabandha and anklets are the ornaments worn by the ogre proximate to the feet of Vishnu. Anklet with droplet is worn in the right leg whereas his left leg is inhumed in the undulated surface. The ogre to his east is decked with bangles, udarabandha, patrakundalas. Yajnopavita is worn in upavita fashion which is with droplets. Both are shown with fangs. Both the demons are in a swift pace one after another to escape from the assault of the troupe of Vishnu. The demon near the feet of Vishnu is moving opposite to the God, spreading his left hand on his back, his head and body tilted backwards and the sword in his right hand upturned. His gestures reflect as if he unable to bear the heat of the fire spit by Aadhisesha. 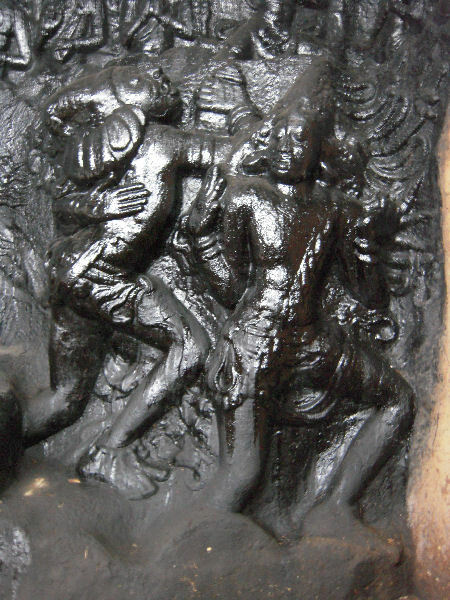 The second demon is leading the flight is in all his panic, with his head turn towards the deity, his left hand is in vismaya whereas the right hand is showing stop in anxiety. His looped locks are swinging in air to his pace. A female figure  is seated in garudasan with hands in anjalihasta in the front adjoining twirled body of Aadhisesha and also under the right foot of Vishnu. Her head is arranged as jatamakuta and loose locks are floating upto her waist. She is wearing pattadai and vastra yajnopavita but breast band is absent. All her ornaments are beaded and she is decked with bangles, armlets, mala, kundalas and shoulder ornaments. 28. According to Devi Bhagavatham, the two ogres Madhu and Kaitabha were formed out of the wax of Lord Vishnu’s ears and also acquired great powers from the goddess Devi Mahamaya after rigorous tapasya. One day they come across Prajapati seated on lotus and challenged him for a fight or otherwise to vacate the lotus seat. Brahma thought of the strategies of sama, dana, beda, danda but find it futile on the mighty ogres, he finally took refuge in the stalk of the lotus and sort the help of Lord Vishnu who was in yoga nidra. Lord Vishnu was made to wake up and he took the challenge of killing the ogres. The fight between the ogres and Vishnu went on for five thousand years and Vishnu was tired and realized that they can be finished only with wise and not might. He prayed to Mahamaya for help, and their contrivance end the life of the ogres. Thus in Devi Bhagavatham Devi is extolled as a supreme power. But the same theme in Vyasa Bharatam is narrated in another version, where Devi is absent, the two ogres formed out of two water droplets in a lotus on which Lord Vishnu set his eyes. In the honey like drop sprang up a daithya, came to be known as Mathu and the other droplet is hard in which sprang up another one came to be known as Kaithaba. While they were walking around the lustrous lotus with their mace they came across Brahma who was creating the Vedas. They snatched the Vedas from Brahma. Brahma in fear ran to Vishnu and prayed for the restoration of the Vedas. Lord Vishnu who was in yoga nidra was made to wake up and he took the form of Hayagriva and killed the danavas. As a slayer of Mathu came to be known as Mathusudana.